On this page we will bring you daily updates during the four days of the Count. At the end of the Pongal Bird Count, over 250 lists, containing roughly 250 species, have been uploaded by 80 birders. With more lists yet to be uploaded, these numbers will go up. As of now, Puducherry and 23 of the 32 districts of TN have at least one list. The map on the right shows locations of all lists that have been uploaded until now. Please upload your PBC lists by Wednesday the 21st, so that your observation can be included in the summary report of the count! Days 1-3 of the Pongal Bird Count have yielded 194 lists from 68 birders, recording 235 species so far. The locations of the lists are shown on the map to the right in red (Day 1), blue (Day 2) and yellow (Day 3). So far, Puducherry and 20 of the 32 districts of TN have at least one list. Today is the final day of the count — let’s work towards a total of 400 lists over the four days of the Pongal Bird Count!! The first two days of the count have brought in 123 lists from 51 birders so far — these are shown on the map to the right in red (Day 1) and blue (Day 2). Lists have come in from Puducherry and 17 of the 32 districts of Tamil Nadu. As before, the circles are partly transparent, so location with several lists show a deeper colour. 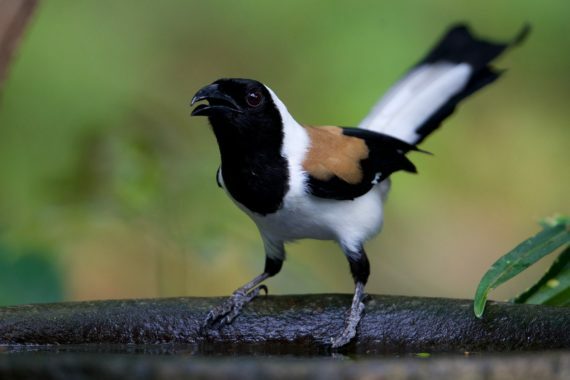 Nearly 200 species have been recorded so far, with highlights including Baillon’s Crake, Ruddy-breasted Crake, Bengal Weaver (Black-breasted Weaver), Scaly Thrush, Red-breasted Flycatcher, Hume’s Whitethroat, Pied Harrier and Black-naped Oriole. Please do upload any remaining lists you have for Days 1 and 2 — and now on to Day 3!! An update from the first day of the Count. Until 0815 this morning, 61 lists have been uploaded, and their locations are depicted to the right. The circles are partially transparent, so locations with several lists show a deeper colour. Nearly 60 lists submitted so far during the PBC which covered 152 different species; from Chennai, Coimbatore, Kancheepuram, Krishnagiri, Madurai, Nilgiris, Thanjavur, Thoothukkudi, Thiruvallur, Tiruchirappalli, Tirunelveli and Tiruppur districts. The very first list of the day came from Ganeshwar SV, from Karadi Malai Camp near Chengalpattu. The highlights so far are Red-breasted Flycatcher, Pied Harrier, Black-naped Oriole and Bengal Weaver (Black-breasted Weaver). A Steady start. Black-breasted Weaver is a good twitch. List of districts that are not represented here are Ariyalur, Cuddalore, Dharmapuri, Dindigul, Erode, Kanniyakumari, Karur, Nagapattinam, Namakkal, Perambalur, Pudukkottai, Ramanathapuram, Salem, Sivagangai, Theni, Tiruvannamalai, Thiruvarur, Vellore, Villupuram, Virudhunagar. Let us see if we can reach one person in each district to upload lists. That is what I’m trying to do Sir! Though some of the following districts will do well, I’ve arranged people from nearly 15 districts Villupuram, Kanchipuram, Krishnagiri, Tiruppur, Chennai, Salem, Thanjavur, Erode, Dharmapuri, Vellore, Namakkal, Tirunelveli. I’m yet to get a confirmation from Cuddalore & Karur. I did plan myself for Krishnagiri but since you came with few checklists, I thought of concentrating somewhere else. We have one list each for Salem, Virudhunagar, Erode and Ramanathapuram.Also I have spoke to few people for Theni, Thiruvannamalai & Dindigul and we can expect few uploads for them tomorrow/day-after. We have planned to cover a bit of Vellore on Sunday. I have done a proxy upload for four lists from Kanyakumari dt sent by SS Davidson of Tribal Foundation, Nagarcoil – so one more district cleared ! We at CNS (Coimbatore Nature Society) did bird counts for PBC in different parts of Coimbatore, Chennai, Dindigul, Salem, Madurai, Erode from 16th to 18th Jan 2015. Our members formed a small group and eagerly participated. Each group updated their counting in ebird.org on their own.